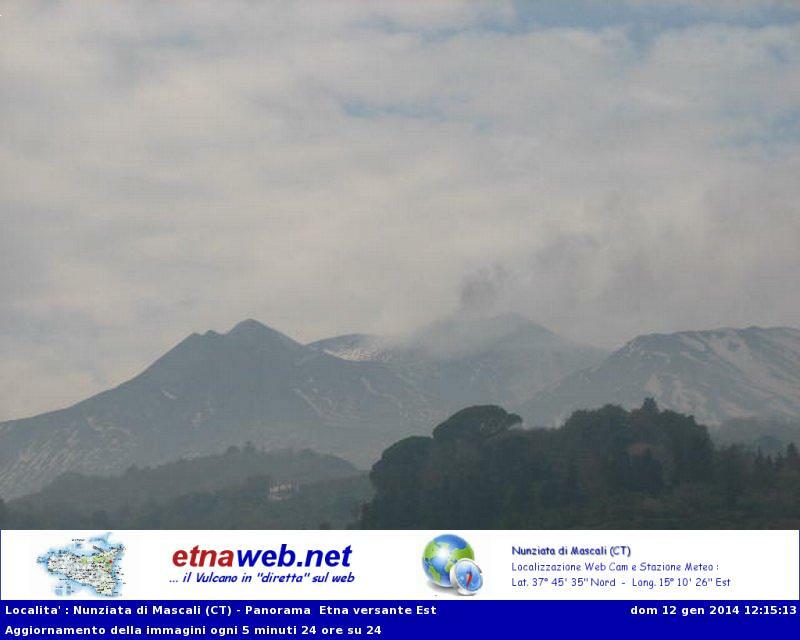 Etna (Sicily, Italy): No significant changes have occurred. While the continuing unusually warm weather has stripped much of the snow on Etna's southern side, diffuse weak ash emissions are visible from the NE crater and tremor fluctuates at low levels. Sinabung (Sumatra, Indonesia): Activity at the volcano remains unchanged. Eruptions with frequent small to medium-sized pyroclastic flows (up to 4-5 km length) continue and more than 25,000 people are reported evacuated. Problems caused by the extensive damage to crops and structures, health and infrastructure problems caused by the ongoing crisis with ash everywhere are increasing. Recommended: Check out some great photos of the glowing lava dome, incandescent avalanches and a superb shot by Sutanta Aditya of a pyroclastic flow and related mushroom-shaped co-ignimbrite ash plume (lighter ash rising from the main body of the pyroclastic flow immediately after its emplacement) taken on 7 Jan.
Pacaya (Guatemala): According to INSIVUMEH, the eruption has considerably slowed down since last evening around 19:15 (local time), although weather prevented detailed observations. Activity at the summit decreased to moderate strombolian explosions with ejections reaching 100 m height and degassing. The ongoing eruption of the volcano involved the opening of at least two effusive fissure vents on the northern and southern base of the Mackenney cone (this info according to images and maps published by CONRED, although CONRED / INSIVUMEH at the same time report 3 vents on the east, west and south flank). CONRED declared orange civil alert and started to evacuate families living in areas close to the volcano.